The concept of MOVE Wellness Studios was born in April 2013 when Elaine Economou and Robin Krienke decided to synthesize their combined 20 year history in management, movement, exercise and wellness training to create a new, boutique fitness and lifestyle studio in Ann Arbor, Michigan. Elaine and Robin previously worked together at Moving Elements Pilates & Wellness and at the Movement Center & GYROTONIC® Ann Arbor. However early in 2013, it became apparent that despite inhabiting a beautiful, downtown loft, there simply wasn’t enough room to accommodate all of the Movement Center’s clients or the expanded services they were interested in providing. 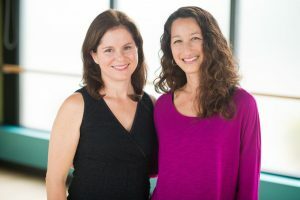 It was this need – and the knowledge that more residents of Ann Arbor and the surrounding areas were becoming increasingly in tune with Elaine and Robin’s vision – that led the team behind The Movement Center to reinvent the studio as MOVE Wellness Studios and start searching for a new location. After a year in business, it is abundantly clear that this model of skilled fitness professionals paired with wellness coaching, massage and the community building aspect of MOVE Wellness Studios has been needed, welcomed and celebrated in the community. Challenging private sessions and group classes, fresh juice and all the amenities MOVE Wellness Studios offers have helped hundreds of people feel great in their body. Our main studio is located on the westside of Ann Arbor. A second location opened in February 2016 on State Street at the Probility clinic, where MOVE Wellness Studios classes and services are available in addition to the MOVE Transition Program, which is a post therapy program designed specifically for those who are transitioning from physical therapy into an fitness routine. We also are excited to announce that we have partnered with St. Joseph Mercy Ann Arbor Health System to offer onsite fitness classes to their Ann Arbor employees and the community. To book a class at any of our studio locations please click here. We are are proud to have such a robust community of movers, working toward fitness and wellness together. Elaine and Robin cheerfully welcome you to MOVE Wellness Studios.